Get married and your life goes to pot. This is what happens in Ira Sachs' Love Is Strange, a confidently uncomfortable, New York-set story co-written with Mauricio Zacharias. This is real love: there is old age, there is debt, there is misunderstanding. There are also terrific performances that will make this romance a modern classic. 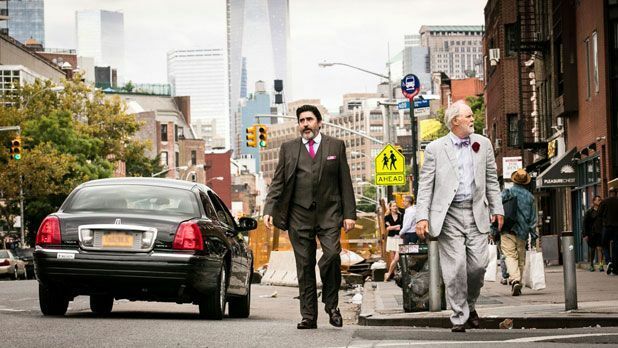 John Lithgow and Alfred Molina are partners who, after 39 years together, get hitched. Ben (Lithgow) is cranky and demanding, while George (Molina) is loving and cheerful. Both need each other in that annoying married way. Actually getting wed, however, separates them: George loses his job as a choir director, because by getting married he has proclaimed his gayness, and they consequently lose their apartment. Ben moves in with his nephew Elliot (Darren Burrows) and his writer wife Kate (Marisa Tomei). He gets underfoot, both with Kate’s work and by interfering in the life of their teenage son Joey (Charlie Tahan), who Ben thinks may be having his first romance with confident classmate Vlad (Eric Tabach). Meanwhile, George sinks little by little staying with a pair of party-hungry policemen. Ageing and struggling, the couple see that times may have changed but their feelings for each other have not. We want them to get back together but know life is never that simple. Lithgow and Molina slot right into their roles as if they’ve been playing these characters their whole lives and their conviction makes Love Is Strange a joy. While Sachs’ handling of the material is not splendid – the pace is a little odd and Tomei’s dialogue in particular feels a touch on the nose – it ultimately rings true: being in love is still the best tradeoff for the pain of living. Selected release from Fri 13 Feb.
After 39 years together, NYC couple Ben (Lithgow) and George (Molina) get married, whereupon George loses his teaching job at a Catholic school and the couple have to live apart while they find a cheaper apartment. Lithgow and Molina are a joy and in spite of uncertain pacing it has all the ingredients of a modern classic.